Peter Fournier conducts tuba players from atop a ladder during Sunday’s attempt at breaking the Guinness record for the most tubas assembled in one place, at Downtown Disney. They broke the record last year with 502 tuba players, but fell short this year with 460. 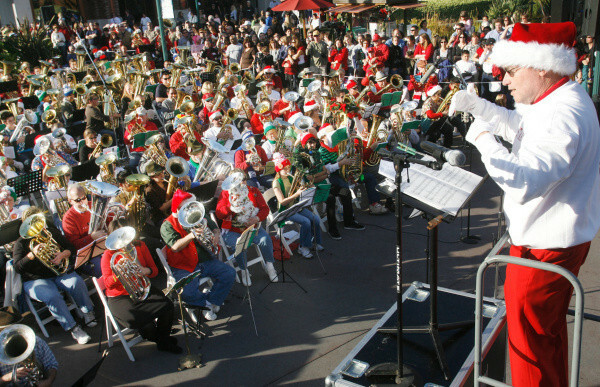 ///ADDITIONAL INFO: tubaxmas.1221.ab01.jpg – shot 12/20/08 – ARMANDO BROWN, FOR THE ORANGE COUNTY REGISTER – tuba christmas 2008 at downtown disney. they’ll be trying to break last year’s guinness world record. last year, nine states were represented when they broke the record for most tubas assembled.